So Good It Outta Be Outlawed. It Once Was. Once upon a time, you could be shot – for just doing a shot. It took Calles and his men five years to seemingly destroy the industry, and on occasion dispensed extreme punishment to offenders. Legend has it some of the distillers were either hung or executed by firing squad for the crime of making the spirit. Yet even outlawing bacanora couldn’t stop its production. Similar to the American backwoods moonshiners, brave bacanora distillers were forced into the shadows to secretly produce their recipes in hidden stills. Their customers, fearful of getting arrested, would often hide bottles in the backs of closets or other secret places — creating bacanora’s infamous reputation as “The Secret of Sonora”. But as the years went by, and the popularity of tequilas and mezcals continued to skyrocket in both Mexico and the U.S., the government caved. It became clear in order to get back in the game, Sonora needed to bring back bacanora. Jesus Enriquez Burgos led this effort. 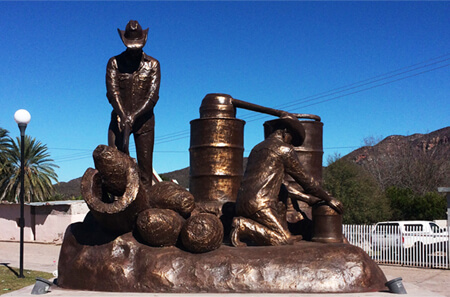 He was an attorney and legislator from the Nacori area of Sonora who spearheaded the movement to legalize production and commercialization of the bacanora industry. In 1992, after almost 100 years of prohibition, the Sonoran government lifted the ban. Finally, instead of covertly enjoying the pleasures of bacanora in secret, citizens could now consume the spirit whenever and wherever they wanted. And Sunora Bacanora could finally be introduced to the world! Although it was once outlawed, bacanora is now available to anyone who can find this Sonoran secret. In the state of Sonora, bacanora is consumed mostly neat. It is most popular when the weather cools off and in the winter months. It’s a common staple around the Christmas holidays when it is shared with friends and families. There are a few bacanora cream products produced by various labels. Though several of these delicious beverages are popular among Sonorans, we believe Sunora Cream De Bacanora Mocha is far superior. As the popularity of bacanora grows Mixologists are experimenting with its mixability and are creating some of the most delicious agave drinks in the industry. Click here to check out some of the latest cocktails using Sunora Bacanora!